Whether you’re a full-fledged adult or an angsty teenager that won’t admit it, there’s no place like home. This weekend, instead of traveling for the fifth meet in a row, the Rowan women’s track and field team was able to stay home, as they hosted the annual Oscar Moore Invitational. The brown and gold showed how much they love the meet through great individual success. 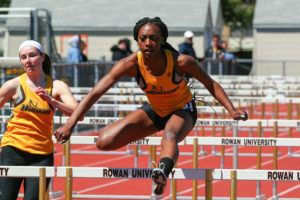 They placed first in the 200 meter, triple jump, 100-meter hurdles and 400-meter hurdles. The 4×100 relay team also took first place. Angel Rowe set the meet record in the triple jump with a mark of 37′ 1″. 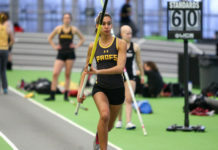 In field events, Jenna Wyshinkski took first place in the javelin. Despite the results, Adamson—who admits that he hates being negative to the team—found some faults in the performance. However, Adamson did say that the team can get back on track. In addition to the weather, Adamson thinks once final exams are over, things will be looking up for the team. He said that once that added pressure of performing in the classroom is gone, the only priority the athletes will have is track and field. 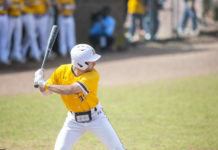 In the meantime, the Profs will travel to Moravian College in Bethlehem, Pennsylvania, this weekend for the Greyhound Invitational. If everything falls in line with Adamson’s expectations, the team should once again perform well in another individual-scoring meet.